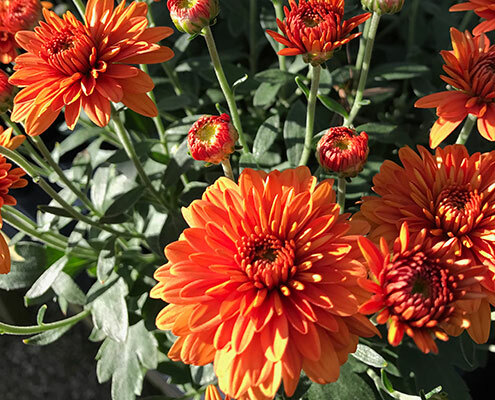 Autumn | Kollman’s Greenhouse Offering The Largest Selection Amongst Cleveland Garden Centers. 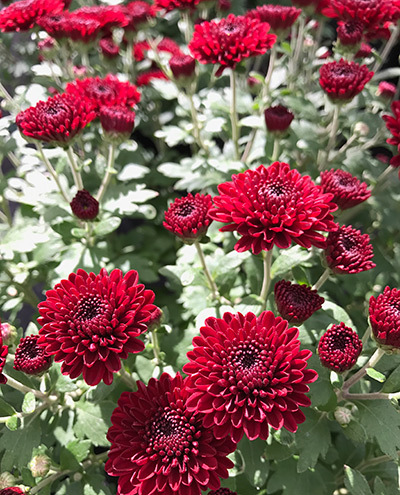 Every spring, late in the season, while our customers are still making their bedding plant selections, we make room in our greenhouses for the upcoming chrysanthemum growing season. We fill several of our greenhouses with thousands of colorful plants in hues ranging from rustic red and burnished orange, to butterscotch and mauve. Each pot is planted and carefully pinched by hand to ensure the fullest plant with a maximum number of blooms to be ready when you want them. Brisk, sunny days with Canadian clouds, Friday night football, and marching bands signal the emerging autumn season. Once the mums bloom and the ornamental cabbage and kale deepen in color, we turn to the task of completing our outdoor decorating for fall. 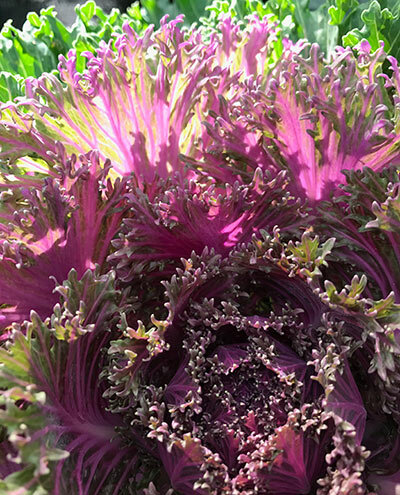 Our ornamental cabbage and kale can be purchased by the flat during the springtime or by the pot during the fall season. These plants reach their peak colors of deep red and pink, green and white, once the night temperature drops – around late September. Kollman’s is one of the leading Northeast Ohio area suppliers of Mums and Ornamental Cabbage and Kale for churches and fundraising organizations. We welcome Mum and Ornamental Cabbage and Kale special orders from churches and fundraising organizations. Please feel free to contact us about your special needs. 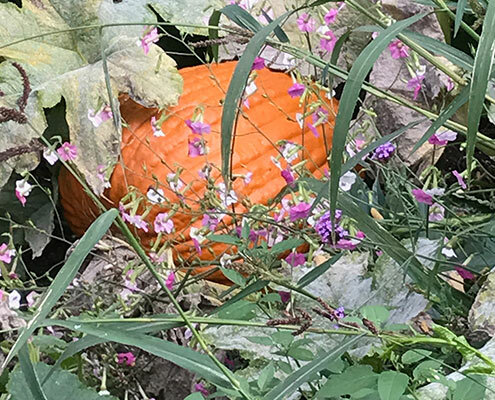 A pumpkin display on your deck or front stoop isn’t complete unless it is centered around full and bushy cornstalks picked from the area’s surrounding cornfields. It’s a must to have the cobs still on the stalks, and opened-up, for added dimension. Don’t forget to add a whimsical scarecrow to keep the squirrels and chipmunks from munching. Try arranging the plants and pumpkins at different levels by using bales of straw strategically placed near the cornstalks. Carve some spooky faces and burn a candle in your pumpkin every night. Why wait until Halloween? Enjoy the season as long as you can. Tie together a bunch of colorful Indian corn with broom corn to hang on your door in lieu of a wreath. It’s a nice change and makes an eye-catching display. Toss various sizes and shapes of gourds and mini pumpkins together in an interesting basket or container. This can be placed by your display, or brought indoors for added color on your kitchen table or fireplace hearth. Don’t forget to plant your spring bulbs before the ground freezes! It is our goal to make the new and novice gardener “Think Spring” in the fall! We can’t stand to see the sad faces of our customers in late March or early April, looking for those crocus and daffodil bulbs to plant in their yards for spring color. Remember, bulbs need a two-week period after planting to throw roots, and then a cold period of even temperatures for 10-15 weeks, depending on the variety. So plant your bulbs in the fall- tulips, hyacinths, crocus, daffodils, snowdrops, anemones. They are sure to put a smile on your face next spring after a long, cold, gray winter!